Bacon Wrapped, Jalapeno Stuffed, Shrimp and Pineapple Kabob Recipe—Wow! What a Mouthful! These are THE best bacon wrapped shrimp kabobs ever or,let’s face it, the best bacon wrapped anything! Grill them over the flames for the perfect crispiness to the bacon or on an indoor grill pan. Bacon Wrapped Jalapeno Stuffed Shrimp Kabobs are my go to recipe for grilled appetizers and are the hit of every party I throw. I don’t know about your house, but nothing brings my family (and friends) home faster than firing up the grill. They can just sense it. The first strike of the match and… Boom! They’re home. I need to have something ready for them to eat and fast. I make sure the shrimp are ready to go by stuffing them with jalapenos and cheese and wrapping them with bacon early in the day and keep them in the fridge until time to grill. The shrimp are easy to skewer after I start the charcoal. Yes… I’m a charcoal girl and no… I don’t live in the dark ages. I like the smoky, mesquite-y flavor that a real fire adds to the food. Admit it. Aren’t you just a little bit jealous when you pull up in your drive way at dinner time and smell the neighbor’s charcoal fire perfuming the whole block? Me, too. While the flames from the charcoal are dying down, I assemble the Bacon Wrapped, Jalapeno Stuffed Shrimp and Pineapple Kabobs. Even better… while the flames from the charcoal are dying down, I have my boys, or some of my guests who love to cook, assemble the kabobs. I often set up a small table top grill (away from the main grill) to cook the kabobs. I tell everyone that it is to keep the flow of the party spread out a little. In truth, it is to keep everyone from circling around and looking over my shoulder waiting for these little beauties to cook. The bacon and shrimp kabobs go fast! So, be sure to make plenty. I count 3 or 4 for each adult… at least. It helps to let everyone grill their own kabob. That way, it seems like they last longer. Get everything sliced and ready to go before removing the shrimp from the refrigerator. If the shrimp are frozen, it is best to thaw them over night in the fridge. Start by removing the stems and the seeds of the jalapenos and cutting them into 1/8 inch strips. Cut thin slices of cheese then, cut the slices into 1/8 inch strips as well. Put the extra cheese away before starting on the bacon and shrimp to avoid cross contamination of the cheese. I cover my cutting board with plastic wrap at this point. Use that as a way to measure the remaining bacon and cut the bacon into strips to match. This is much easier than wrestling each individual shrimp in order to cut the bacon around the shrimp. I used a 12 oz package of center cut bacon and the cut happened to be exactly in the middle of the bacon. Set up all of your prepared ingredients for a fast assembly of the bacon wrapped stuffed shrimp. Start by cutting a slice into the back of the shrimp that is a little deeper than you need to devein it. But, make sure to devein it while you are at it. Start wrapping the bacon around the top of the shrimp and end up at its tail. Try to wrap the bacon so that the melted cheese will not bubble out, but the bacon is not too thick to cook evenly. Cover the bacon wrapped shrimp with plastic wrap and keep in the refrigerator until ready to grill. A note about cross contamination. Please be careful about working with raw bacon and shrimp. I never washed my hands so many times in my life as when I made this dish. Touch a shrimp, wash hands before picking up camera. Touch bacon, wash hands before putting away extra cheese, etc… And Please, resist the urge to nibble on the extra cheese sticks, use them for something you need to heat before eating. The same for the leftover jalapeno sticks… don’t put them in your salsa! When you are ready to grill, soak the skewers while you light the fire and let the coals burn down a little. Then assemble the kabobs by putting a chunk of pineapple on the skewer then, skewer through the bacon and the tail end of the shrimp. Run the skewer through the shrimp and out the front making sure to go through the bacon as well. That will hold the bacon in place and not let it curl away from the shrimp when it hits the flame. Place the kabobs over the flames with the skewer away from the flame. Cook the kabobs for 10 to 15 minutes on each side or until the bacon is brown and crispy. This will depend on how hot your charcoal or gas grill is so, keep an eye on them. 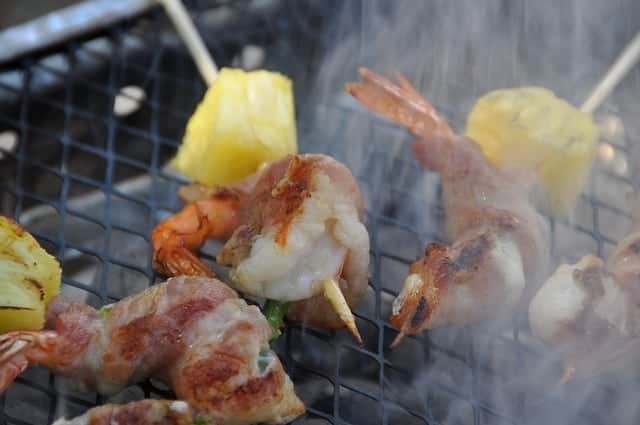 If the bacon is not cooking on the sides of the shrimp, just rotate them a little and use the piece of pineapple as an “anchor” to keep them upright. Cut the stem off the jalapeno and remove the seeds. Cut into ⅛ inch wide strips. Cut ⅛ inch wide slices of cheese. Cut the slices of cheese into ⅛ inch wide matchsticks. Set aside. Measure the length of bacon needed to wrap around the shrimp by wrapping a slice around a shrimp and cutting off the excess. Use the piece of bacon as a pattern to cut the other slices. Hopefully, the slices will be cut in half. Cut a slice down the back of the shrimp a little deeper than you need to devein the shrimp. Remove the shrimp shell, leaving the tail, if necessary. Devein the shrimp. Insert one slice of jalapeno and one slice of cheese into the shrimp. Wrap firmly with bacon. Refrigerate until ready to grill. Cut the peel away from the pineapple and cut into 1 inch cubes. Set aside. Soak the skewers for about one hour. Skewer one cube of pineapple. Then, thread the skewer through the tail end of the shrimp. Make sure to run the skewer through the bacon as well. Run the skewer through the shrimp, out the front end and through the bacon. Skewering through the bacon will keep it from curling away from the shrimp when it hits the flames. Grill over medium high heat on a charcoal or gas grill for 10 to 15 minutes on each side. That will depend on how hot your grill is so, keep a close eye on them. Serve with your favorite salsa if desired. Oh. My. Gosh. These look like the ultimate appetizer on the grill – easy and yet packed with falvor and textures. Fabulous! 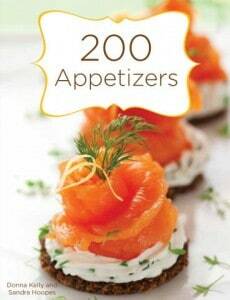 Hooray, this recipe jumps to the top of the list for “What to do with the next shrimp harvest”! The ingredients are standard stores but the results look scrumptious. Seattle Dee- You really should try these. They are fast and easy and are eaten faster than you would believe. Hope you are on some great adventure! WOW!!!!! These are impressive!!!!!! I am so making these for our next get-together!!!! Sabrina-these are ALWAYS the hit of my parties. My family and friends totally recommend them! On the ‘appetizers for dinner’ menu tonight! YUM! …..and thank you! You will LOVE these! I have to put them on the grill in small sized batches in order to keep them from being devoured all at once! My Daddy used to make these for us!! I Love Them! !